Due to its nature, the internet is per se an insecure environment. Web applications are exposed to a wide range of possible security attacks. Therefore, when developing web applications there are many security considerations that have to be taken into account to prevent any (known) security flaws. Contrexx provides a set of functions to deal with common security flaws like Cross-site scripting, SQL-Injection and Cross-site request forgery. See http://en.wikipedia.org/wiki/Cross-site_scripting for detailed information about XSS. To prevent cross-site scripting flaws in the application, all user generated content must be escaped into its HTML-representation. See http://en.wikipedia.org/wiki/SQL_injection for detailed information about SQL-Injection. See http://en.wikipedia.org/wiki/Cross-site_request_forgery for detailed information about CSRF. Every request to the backend is protected with a CSRF-Token. Meaning that every request to the backend fails if no or an invalid CSRF-Token had been supplied. Requests blocked by the CSRF protection system result in the error message shown in the right box. So basically, you won't have to bother about making a HTML-form or anchor-tag working with the CSRF protection system. The current implementation of the Contrexx CSRF Protection System does not distinguish between GET- and POST-HTTP-Requests. That means that not only all POST-HTTP-Requests are verified of having supplied a valid CSRF-token, but also all GET-HTTP-Requests. This is a huge usability flaw, because it often causes non-action requests (regular browsing) to be reported as false-positives by the CSRF protection system. 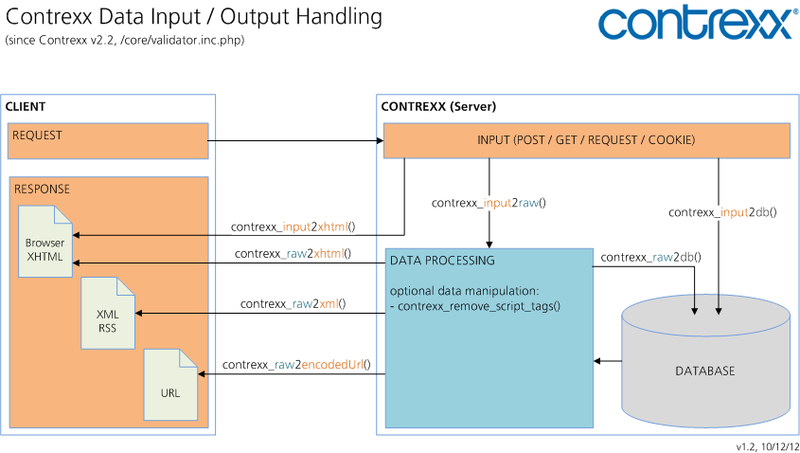 By applying these two simple rules, the Contrexx CSRF Protection System could be reduced to HTTP-POST-Requests, because we would no longer have to expect receiving any harmful requests over a HTTP-GET-Request. This would eliminate the huge usability flaw of false-positives as we have explained above. Note: This shall not be confused with AJAX-requests (XMLHttpRequest) where the usage of CSRF-tokens is not required.